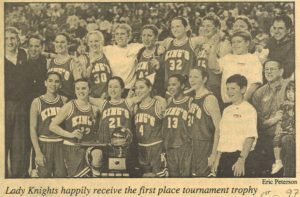 This March, the Washington State Girls Basketball Coaches Association will induct six into its fourth Hall of Fame class, including King’s Head of School, Eric Rasmussen. 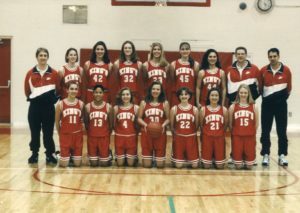 During his eighteen years as the Head Girls Basketball Coach, Rasmussen had an overall winning record of 373 wins and 99 losses, his teams placed in the top eight at the State Tournament eleven times, and won three State Titles. With his exceptional coaching career at King’s High School, there is no doubt that Rasmussen is deserving to be inducted into the Hall of Fame. When asked about his coaching philosophy, Rasmussen knew he was a tough coach. His teams worked hard day in and day out, and yet, he always found time to make sure the girls – and coaches – were having fun. In the first year of the Rasmussen Era, the team delivered their first winning season in many years. By his third year of coaching, the Lady Knights qualified for the State Tournament. From then on, making it to state became a team benchmark and they qualified for state fourteen years straight. In all of his successful years of coaching at King’s, there was never a time Eric Rasmussen didn’t want to be a part of the program. Reflecting back on his time as a coach for King’s, he hopes he played a small part in the character development of his players.